This is an extract from a review by Asia House. To read the full article visit the Asia House website. 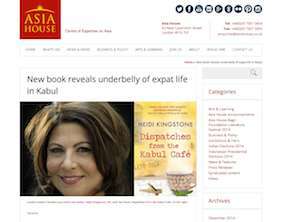 A new book casts light on the realities of expat life in war-torn Kabul. London-based Canadian freelance journalist and author Heidi Kingstone lived in Afghanistan between 2007 and 2010 to write freelance stories about events and people in the ISAF-controlled city. Dispatches from the Kabul Café is an illuminating series of vignettes of personal encounters and experiences that she had in Afghanistan. “It was a unique time in history. Afghanistan was once again at a crossroads and I was there to observe it,” she said, over the phone one cold December’s day. Her book will be published in March 2015 by Advance Editions, a pioneering publishing house which offers peer-to-peer editing. It contains a memoir of her various experiences there, ranging from light and entertaining anecdotes (such as dalliances with other expats and finding the best coffee in Afghanistan) to treacherous missions to track down weaponry and to save locals in fear of their lives.